My husband and I did your online course leading into the arrival of our first baby. We live rurally and loved the flexibility of being able to do the online lessons at times that suited is and to re-watch things as we liked. The things that were most salient for me were creating a peaceful birthing environment and understanding the relationship between fear and the body’s hormonal and physical responses- the science behind the ‘hippy/zen’ stuff if you will! For my husband it was having a concrete list of helpful things to do and say to really be hands on and supportive. After watching the video of Alisha’s hypnowaterbirth on one of the lessons, we began referring to her as a “hypnobirthing hero” the epitome of a serene calm birth which became my husband’s somewhat tongue-in-cheek prompt of “channel Alisha” while I was practising my techniques! On Fri evening 12/2/16 I began having fairly strong surges at 10 minutes apart which gradually progressed to 5 minutes apart at around 6am. I was managing well breathing deeply through them and listening to my tracks as we drove from our farm to the hospital in town. On arrival, we were told our lovely midwife who was very supportive of Hypnobirthing and our birth preferences was unable to come and her back-up would be in attendance. My first “Oh Sh#t!” moment! I had met her once before and she has a rather chaotic presence in a room and not all that warm in nature. But I re-grouped and told myself “You don’t need her, you’ve got this, just tune out to all distractions” Once we got settled in our birthing room I wanted to darken everything it was too bright and busy and as predicted our replacement midwife was buzzing around and chatting furiously like an energiser bunny on speed! I put my earphones in and listened to my prompts for birthing’ track and waited for the bath to be blown up and filled in the darkness of the bathroom. Once I was in the warm water and the darkness I could get into my surge rhythms again and mentally re-group. At a certain point I became restless and was getting surges one on top of the other with no time to rest- they were very powerful and difficult to breath through and this was my point of “Maybe I can’t do this” (it’s only now I can reflect that this was actually me in transition). Shortly after I began getting the urge to push and my surges although strong were again giving me a minute or two to mentally re-group between and I was back in the zone! The midwife kept saying “You’re not there yet, first time mothers have a long 1st phase, don’t push” and I ignored her and remembered to “Trust my body, it knows what to do” and my husband quietly said, “If you feel it’s time, then it is.” I could feel the baby only an inch from crowning and despite my midwife continuing to try and tell me otherwise- I knew we were close! Apparently the spirit of Melissa Spilsted knew I was right too, because on my playlist of tracks it just so happened that almost in complete mirror of what was happening the exact words of the “breathing down” and “lotus flower” prompts came over the speakers! It was just the reassurance I needed! I lay back against my husband with our little boy against my chest in the warm water, so incredibly in awe of the tiny human we made and brought into the world. I turned to my husband and laughed saying “I don’t think I did too well channeling Alisha in that last part” (I’d ended up a little more primal and less serene than intended!) and he said “No you didn’t it was more……ummm…Xena Warrior Princess” Which is a comment I’ll treasure forever coz that’s how I felt afterwards- empowered and strong! My experience was incredible and I am so grateful to have found Hypnobirthing Australia’s (Hypnobubs) online course! Thanks Melissa! 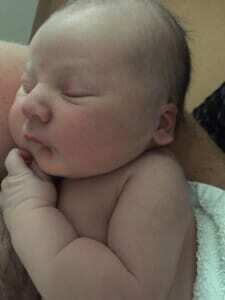 Here is a photo of our gorgeous healthy chubba bubba Evan James ?